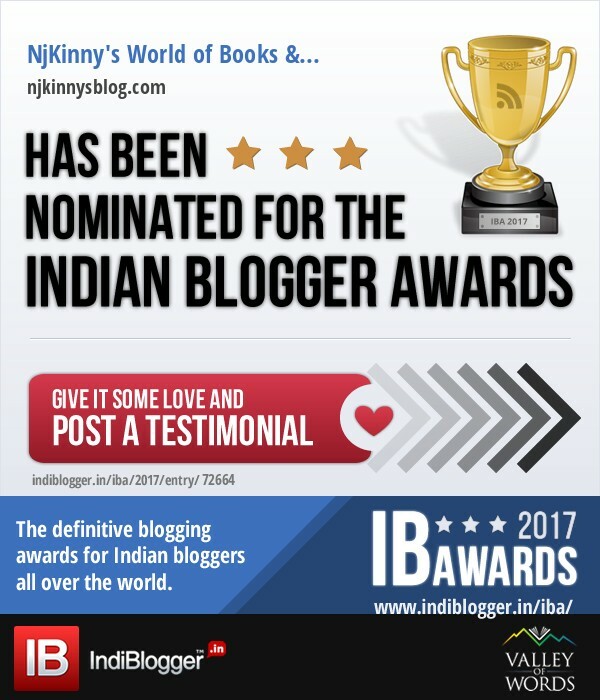 I am so excited to share with you all that Njkinny's World of Books & Stuff (NWoBS) has been nominated for the Indian Blogger Awards 2017! This is my first time for this award and I am so nervous. NWoBS started almost four years back as a means of letting free my creative spirit and escape the chaos of reality. In these past years, I have met some really awesome people which include Bloggers, Readers and Authors, not discounting the amazing PR people from various agencies, publishing houses and other media. The journey has been eventful to say the least and I am so thankful to each and every one of you who read my posts and take time out to leave comments, share your views and show love and encouragement to me. THANK YOU!!! With the below awards, I have taken a shy step to mingle among the elite and pro blogger world and would really appreciate any support you can show me. Please leave you comments, testimonials on the link below and share the news of NWoBS' nomination with friends and family. I hope to write and keep entertaining you for a lot more years.